November 22, 2003 Reported in [Spirit Daily.com] from the [Starbeacon]. Written by Shelley Terry. Ashtabula Township pilgrims are stopping at a tree they say features the likeness of the Virgin Mary. The Lord may work in mysterious ways but a tree in Ridgeview Burial Park? 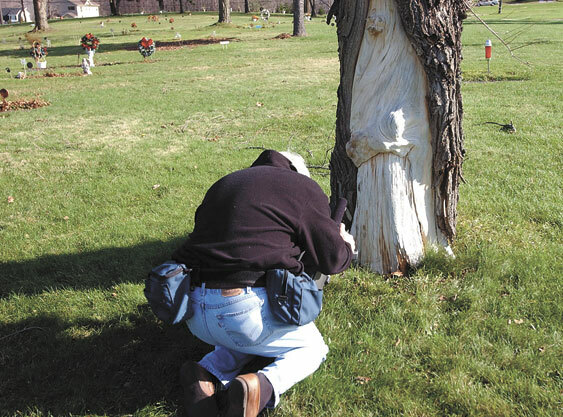 A gnarled ash tree, across from the cemetery office, caused a sensation Friday among believers who say the scar in the bark is a dead ringer for the Blessed Virgin. It sure does look like her from here, said Sam Bucci, township trustee, as he stood about 20 feet east of the tree. Ive been here 100 times and never noticed it, but it does look like her. Bucci brought his grandchildren, Christie and Jack McClure, to see the image. Christie, 3, said it looked like a mommy holding a baby. Five-year-old Jack agreed.Cemetery caretaker Gary Patton said a steady stream of cars drove through or stopped Friday at the 70-year-old burial park, as well as TV news crews, shooting footage for their 6 p.m. broadcasts. Shirley Mauro of Ashtabula Township, who spotted the tree last week while visiting the cemetery, was there with her husband, Pete, talking all about the tree. She yelled: Stop. Stop. Thats the Virgin Mary! I said, No, thats a concrete statue in front of a tree, Pete Mauro said. She jumped out of the car, and it was the tree. After reading about the apparition Friday morning in the Star Beacon, Pat OBrien, 78, of Ashtabula, drove to the cemetery. The farther you stand back, the better you see the image of the Virgin, he said. I think its just great to see people of faith come out. Its a beautiful day, too. Carly Jones, 35, of Perry, admitted she was skeptical at first. But when I walked up to it, I said, Wow! It is Mary! Jones said. Others werent quite so sure. Its what you make of it, Patton said. Some people see Mary. Some see a mother and child, others see a lady praying, and a few say its our guardian angel. The Virgin Mary is said to have appeared to the faithful all over the world, including in [Clearwater Florida], Chicago, Fatima, Portugal, Lourdes, France, and Guadalupe, Mexico, among other locations. Directions to the The Virgin Mary infant Jesus tree - Here are the driving directions from Cleveland. Take I-90 east to Exit 223/Route 45 (this is about 50 miles from downtown Cleveland.) Go North on 45 to the first traffic light. Turn right/east at the light onto Old Austinburg Road for about four miles. Look for the Ridgeview Burial Park on the left side of the road.The trip will takes just over an hour from downtown Cleveland. Note: The Yahoo Maps and MapQuest services will give you driving directions that take you to a road that's underconstruction and closed.